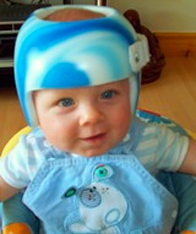 Six-month-old Erskine boy, Reihan is suffering from a condition called flat head syndrome, also known as Plagiocephaly. His parents Susan and Andrew from Renfrewshire, have been disappointed with the lack of awareness of the syndrome and the treatment available to correct it. Mum-of-two, Susan, is keen to increase profile of the condition, which she battled to get funding for. “We also had concerns about the forming of Reihan’s fontanel, which we shared with our GP. We went to see him on several occasions and he referred us to the RAH (Royal Alexander Hospital). It was here that Reihan had his head X-rayed to check that all the bones were forming correctly. The results of the scan were fine which was a relief, however, we were still concerned with the shape of Reihan’s head. It was so flat at the back and down one side. Online, Susan read other parents’ stories and learnt that there were clinics across the country, including one in Glasgow providing treatment. “Without hesitation we made an appointment to take Reihan to see the lead clinician at the Technology in Motion from clinic in Glasgow and thank goodness we did. We haven’t looked back since. The clinic provides a treatment called TiMBand. It’s a helmet that’s fitted to the baby’s head and remoulds the head to the shape it should be. He has to wear it for 23 hours a day and has really taken to it.